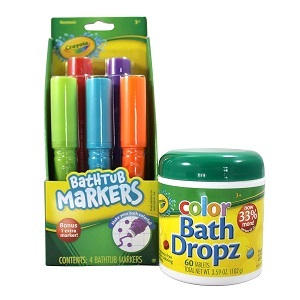 Bring out your child's creativity and imagination with these Crayola Bathtub Markers. Kids will have endless fun creating masterpieces on the tub or tile walls. Crayola Bathtub Markers offer 4 classic colors. The Crayola Bath product line brings the color, fun, creativity and imagination of the Crayola brand to bath time. Crayola Bath Dropz are fizzing water color tablets that turn ordinary bath water into colorful, fizzy water. Mix and match the tints to create all the colors of the rainbow. Color assortment may vary.